Could shrouded burials be the next trend in green funerals? If we look at the last 10,000 years of human history the casketed cemetery burial is a rather contemporary practice. Nearly every religion in both Western and Eastern worlds including Christianity, Muslim, Hindu, Buddhism, and Jewish--which together account for about 70% of the world population--have various death rituals that involve burial shrouds. For the last several thousand years of human history, the majority of death rituals included some type of burial shroud. Yet today the shrouded burial is almost unheard of in the Western World. Very few people--less than 1%--have witnessed or otherwise participated in a shrouded funeral followed by either burial or cremation. The world population surpassed 7 billion near the end of 2011. There are more people living on the earth than ever before--and that also means there are more people dying than ever before. More than 50 million people will die this year and most of them will not be entombed in steel or wooden caskets in concrete burial vaults as Westerners today would call a traditional burial. Most of the deaths on this planet of ours will follow a cultural or religious death ritual that involves a burial shroud. Only recently has the green and natural burial movement brought the burial shroud into conversations on death care in the Western world. And at that, there appears to be more talk about burial shrouds than actual shrouded funerals. Very few Westerners are planning shrouded funerals. A quick survey of google search trends for "burial shroud" shows zero searches prior to 2010 and trace interest since 2011. Searches for "natural burial shroud" or "green burial shroud" turn up zero searches. In 2005 the acclaimed HBO series, Six Feet Under, enacted a shrouded burial for one of the lead characters. The burial shroud used in the final episode was a secular creation by Esmerelda Kent. An artist and environmentalist inspired by her practice in Buddhism, Esmerelda starting making green burial shrouds in 2004 and founded Kinkaraco. Hand-made in California from biodegradable natural fibers like organic cotton, linen, and silk, Kinkaraco provides burial shrouds to funeral homes throughout the United States. Could shrouds be the next trend for green and natural burial? The Green Burial Council is an advocate of burial shrouds as are the many conservation cemeteries opening up around the U.S. Kevin Corrado, natural burial facilitator at the Natural Path Sanctuary in Verona, Wisconsin expresses "that our preference is biodegradable fabric shrouds, but we do allow caskets and other containers." Several funeral homes in close proximity to natural burial sites are adding green funeral packages but typically include a green casket made from biodegradable materials including wood, willow, and seagrass. Those that offer a shroud are finding that very few families opt for a natural burial shroud when a green casket is available. Organic Cotton Burial Shroud with Wooden Trundle by the Northwoods Casket Co. 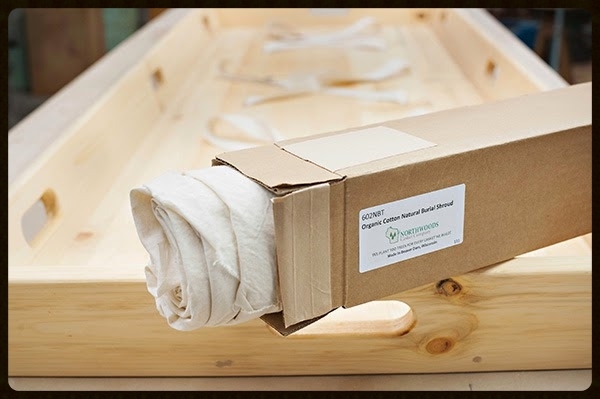 There are a handful of online retailers who sell green burial shrouds to the public or via wholesale to funeral homes. In addition to Kinkaraco, also founded in 2004 there is the Natural Burial Company founded by former organic grocer, Cynthia Beal, based in Eugene, Oregon. Tennessee-based, Forlora offers burial shrouds made from dupioni silk or cotton inspired by the Baha'i faith but also offers secular shrouds since 2010. Another online retailer, Village Memorial, offers a selection cotton burial shrouds. Retail prices for burial shrouds tend to range from $250 for cotton and up to $500 or more for silk and intricate hand-made designs. What families are opting for a natural burial shroud? Dwight Cushman, founder of Village Memorial, has observed that families opting for a burial shroud are doing so out of a need to be more hands-on in the funeral ritual. In the last few years there has been a transition by many shroud makers to move from their culturally or religiously inspired roots to make shrouds that are secular and more creatively expressive. Artisans are adding their own personal touches utilizing reclaimed printed fabrics, natural dyes, scented oils, flower petals, and a variety of other creations. Those opting for shrouds seek an alternative to the conventional funeral. In the great scheme of things, Westerners make big changes quickly. In 1950, 70% of caskets buried in the United States were made of wood. By the late 1960s, steel replaced wood with 60% of the market. Similarly, cremation trended from less than 4% in the 1960s to more than 40% by 2010. Contemporary burial shrouds just might have the right blend of environmental consciousness, artistic expression, hands-on involvement, historic relevance, affordability, and a loose connection to a variety of religions faiths to appeal to the very diverse population that makes up the Western World today in order to become the next great shift in funeral practices in the United States. Newer PostThe Green Hearse: Novel Idea or More Greenwashing?